At AAMCO of Henderson, we take pride in offering a full range of auto repair services. Whether you're in need of a regular tune-up or a major repair, our skilled technicians will work with you throughout the entire vehicle repair process. We repair all makes and models of virtually any car or light truck. That includes all front-wheel drive, four-wheel drive, two-wheel drive, and all-wheel drive vehicles of any foreign or domestic makes. Fleet vehicles we commonly service include Grumman trucks, box vans, cutaways, and stakebeds. At AAMCO of Henderson, we offer the advantage of both personal service and the resources of a nationwide network of auto repair facilities. We can work with you directly on your vehicle repair, while drawing from a technical database of hundreds of AAMCO car care centers across the country. Additional advantages of working with us include free towing with a rebuilt transmission or major auto repair, experienced technicians, and the very latest in diagnostics equipment. We also offer extended warranties, service contracts, and generous fleet maintenance agreements. 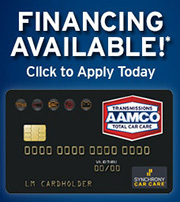 To learn more about the benefits of working with AAMCO of Henderson, call us today!